The i8 roadster: “Reasonably close” to this concept. BMW will launch a convertible version of its plug-in hybrid i8 sports car next spring. The i8 roadster is expected to be unveiled in November at the Los Angeles auto show before going on sale in the U.S. and other markets in early 2018. BMW officials won't answer questions about the vehicle yet, but the company essentially confirmed the i8 roadster this month with two actions. First, in a presentation to investors, BMW showed a picture of a vehicle labeled the i8 roadster on a slide of upcoming electrified vehicles. The slide's timetable showed it coming in 2018. Then the company released a teaser video of the car on Facebook. BMW has been hinting at a convertible version of the i8 since 2012, when it showed the i8 Concept Roadster with eDrive. The company showed another concept, the BMW i Vision Future Interaction, at the 2016 Consumer Electronics Show. 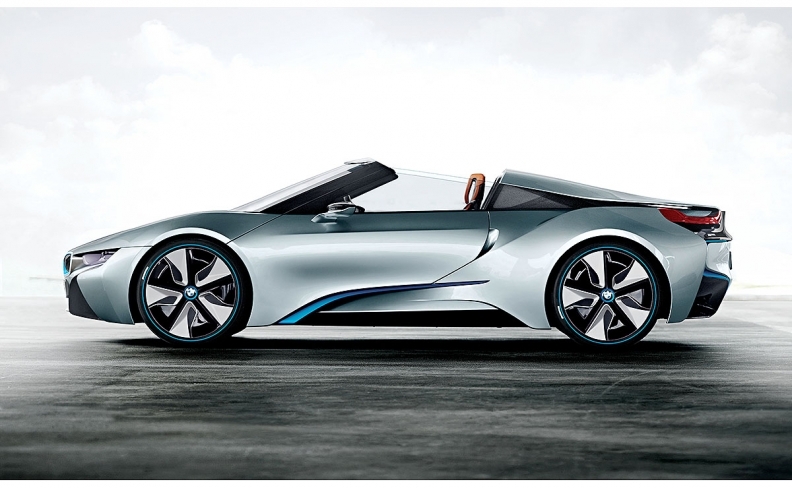 The production i8 roadster will be "reasonably close" to the concept designs, a source said. The roadster will arrive as the existing i8 coupe gets freshened in 2018, gaining longer range and more power. The i8 coupe, with a starting price of $144,350 including shipping, was introduced in 2014. BMW sold 1,594 i8s in the U.S. in 2016, down 30 percent from the nameplate's first full year. Though the i8 remains a hybrid for now, BMW is likely to make the car fully electric when it is redesigned in 2022.